The US XR250L is based on the US 1986-1995 XR250R model. XR250R Gen 4 and 5 and all XR250L models (91-96) are the focus. 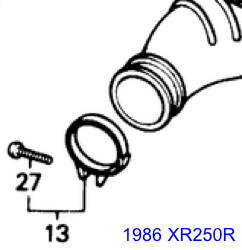 Other XR250 / XR250R years are not considered herein. 96 and newer are available from Honda dealers - about $250 and up. I have never had the opportunity to hold all 3 carb models in my hands at one time, but I have held each of them at one time or another. I first thought about comparing them when I bought my 1991 XR250L and began to study that bike's carb to see if I could improve it's performance using XRR jetting parts. I was able to physically compare the XRL carb to my 86 XR250R carb and make decisions about parts swapping. As I create this web page, I have NONE of the three carb models available, so I will resort to parts fiche and old notes. DISCUSS choke, AP, inlet, outlet, length, height, width. Jets are chosen by vendors, and are not necessarily the sizes you should use. Jetting is dependent on riding elevation, temperature, humidity, and the state of engine tune (performance modifications). 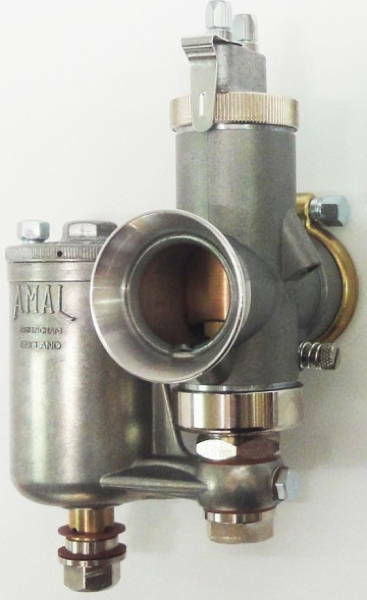 The air box connecting tube front opening fastens to the back of the carb, and the band clamp size reveals the size of the back of the carb bell. 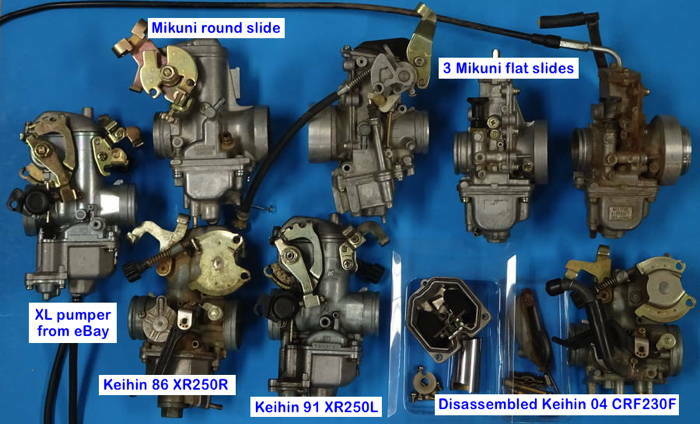 Honda groups some carb parts into sets; other parts are listed individually. These sets make do as rebuild/repair kits. 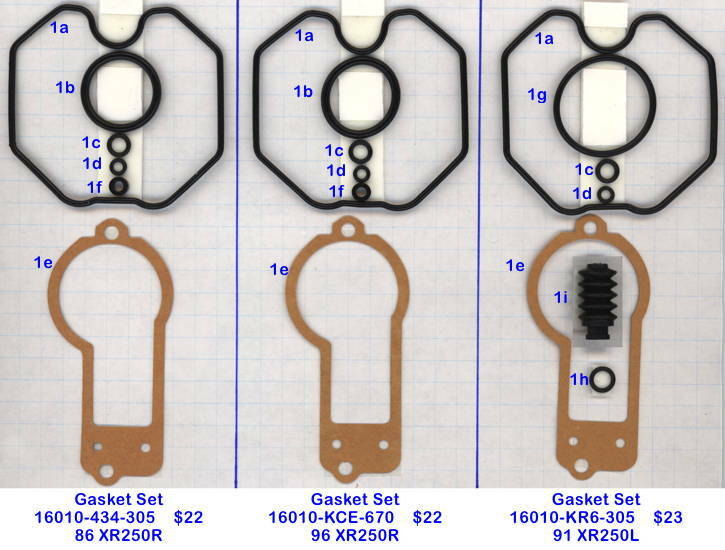 I show the Gasket Sets for the three carbs of interest. The parts are keyed to these tables ↓ and the fiche shown in the aftermarket kits section below. The XR250R carb Gasket Sets are identical; the XR250L carb Gasket Set differs slightly due to the accelerator pump and the absence of a float bowl bottom bolt and air cut-off. You can see a list of the other sets by looking at the comprehensive master spreadsheet near the bottom of the web page. The aftermarket parts in the Shindy rebuild kit (left picture just below) are keyed to stock Honda parts shown in the table and fiche. The parts break-out shows parts in each Honda set. 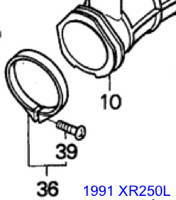 Honda does not uniquely number each part in a set, but I have numbered these parts so they can be located on the fiche. 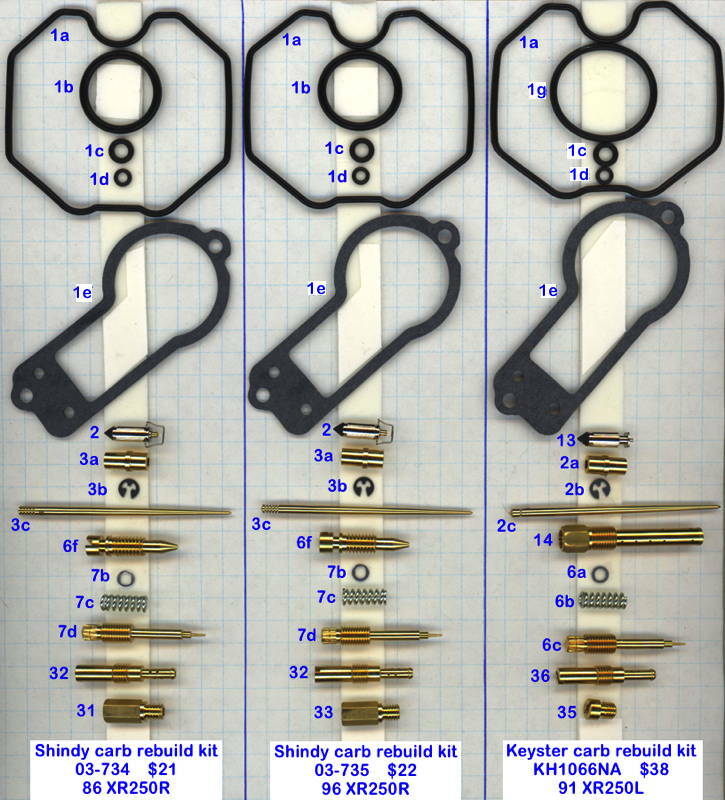 A picture of all three rebuild kits showing all parts at a glance so differences can be easily seen. The similarities between kits, with the notable exception of the accelerator pump on the 250L, indicates how interchangeable these carbs and their parts are. The accelerator pump carb on the XR-L looks like it has potential. Pumper carbs can be jetted to get rid of that nasty four-stroke hesitation on the bottom and give good power on top too. However, the non-pumper carb from the XR is ultimately a better performer because it is designed for more air/gas flow. The needle and seat on the pumper carb are designed to make the bike EPA legal (lean) and are the biggest impediment to performance. Where I wrote 'needle and seat' I should have written 'needle, fuel screw, main jet, and pilot jet' because these items collectively limit the carb's performance so it conforms to EPA standards. 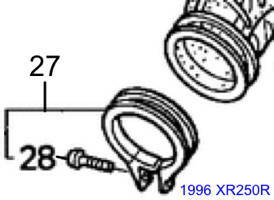 I suspect that changing the needle to an XR250R needle would provide a significant improvement in performance. Getting the jets correct for your riding elevation and setting the fuel screw for optimal off-idle pickup would be the final tuning steps necessary for best performance. Setting up the accelerator pump would be the icing on the cake. I actually think a correctly set up XR250L carb would be the perfect carb to install on 86-95 XR250R bikes. I plan to set up a 250L carb for a local XR250R rider, and will post up results when they are available. When the 1991 XR250L arrived, many of us saw it as a derivative and extension of the XR250R Gen 4 line that began with the long-stroke 1986 engine. As we delved into the XRL, we saw that it was just an XRR with street-legal additions (lights, horn, battery), and we knew the path from a street-legal XRL to a more dirt-oriented XRL could be facilitated by the simple replacement of XRL parts with aftermarket-improved XRR parts. When the 1996 XR250R was studied, it was clear that it was a next-gen bike, and moving parts from this newer model to the XRL might not be so easy or productive. All of this is to say that it is important to mention the YEAR and MODEL when talking about which parts crossover.